Did you ever try this athletic challenge? Maybe in Phys-Ed at school or at a Sunday-school picnic? It takes quite a lot of coordination. It is easy to tumble, or worse yet, to walk around in circles. One person’s right leg is strapped tightly to their partner’s left leg. So neither can walk normally. Both need to step their tied leg forward at once, then step the outside feet forward. It is very interruptive in terms of your normal gait. It is abnormal. This is what is happening in South African politics. The ruling alliance is like the two legs tied together. For it is just that – an alliance. Two of the organisations within that alliance are quite Leftist – the COSATU trade union and the South Africa Communist Party. This is the ANC’s Left leg. It is trying to keep out of step with the other Leftist parties – the EFF, BFLF, the new Socialist Workers Party and others. We don’t know for sure just yet, but presumably Hlaudi’s new party ACM and Manyi’s new party ATM are left of centre as well? Meanwhile, the ANC has historically been a “broad church” trying to appeal to right-wing voters as well. Call it a kind of centrist balancing act. But there are clearly elements of a Right leg in the ANC as well. President Ramaphosa has both a union background and a period in private enterprise. So he is a good example of a centrist who can appeal to both sides. In the past week, for example, President Ramaphosa was giving assurances that the independence of the Reserve Bank is sacrosanct. While at the same time the opposite message was emanating from the ANC’s secretary general and its youth league. Basically, these two legs have been tied together, in what David Mabuza calls “unity”. It is really one ruling alliance trying to keep pace, and out of step with the opposition, to avoid a falling, or worse yet splitting. So the party that coined phrases like “radical economic transformation” and “white monopoly capital” is also trying to get tough on crime, catch those who are guilty of corruption and patronage, and create more Jobs. It may be unity, but there is a loud lack of coherence as well. To stay in power, the ANC will also have to keep out of step with the opposition parties on its right side. These are led by the DA, the second biggest party and thus the official Opposition. But you also have UDM, COPE, Agang, ACDP, Freedom Front, etc. and the intrepid Patricia de Lille’s new party GOOD. To compete for the votes on that side of the electorate, the ANC will either have to rob the opposition parties of their ideas and re-cycle them (like its sudden swing to Renewable Energy) or present some sensible policies of its own. It can expect the support of the Tribal Chiefs who tend to be very conservative. And of some major church groups like the ZCC which is anything but Leftist. The ANC’s track record over 25 years is abysmal – on job creation. Unfortunately the Leftist chromosomes in its DNA make it hard to create the optimal conditions for private enterprise to thrive. 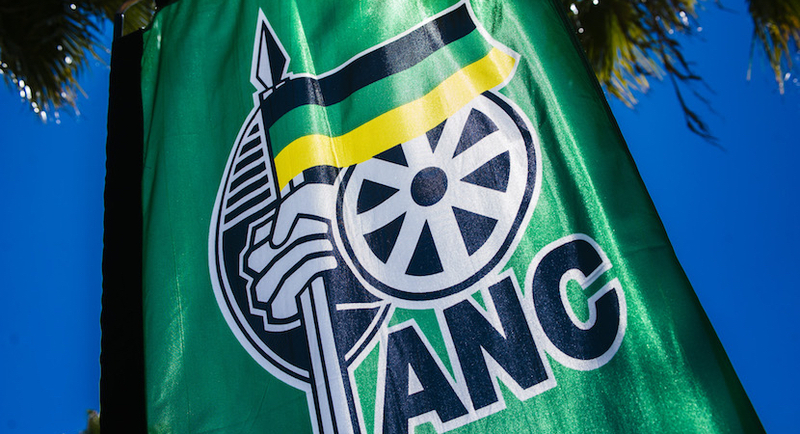 Two recent developments are going to shake the ANC’s electoral ambitions on its right side. First, the move of ex-Mayor of Pretoria Solly Msimanga to become candidate for Premier of Gauteng province. The other big city in Gauteng is Joburg, where another DA mayor reigns. In a highly urbanised setting like Gauteng, Jobs is a bigger issue than Land. Together these two mayors have performed reasonably well since taking over after the 2016 municipal elections. Gauteng could well follow the Western Cape into the hands of the Opposition. Especially given the emerging testimony of Angelo Agrizzi at the Zondo Commission into State Capture – the second development. This is a hard blow to the ANC’s effort to convince people that it is cleaning up corruption and patronage. Its credibility on this is taking a beating, and it could end up losing its stride in the three-legged race. Its market-share of the Vote could shrink considerably? Meanwhile, can it stay out of step with the “hard Left”? The EFF has been beating the drum of land expropriation without compensation since it was formed, just before the last general election in 2014. Certainly the left foot of the ANC has been walking with the EFF on that one. But is this issue still going to win votes in 2019? Voters may be more concerned to clean up government (i.e. “drain the swamp”) before putting it in charge of such a massive re-jigging of land-ownership. Otherwise, implementation could become politicised the way it was in Zimbabwe, triggering economic collapse that this week seems to be on the brink of melt-down. Such a huge undertaking should be non-partisan. In the 2019 election, the two major issues are Jobs and Corruption. That was not the case five years ago when the EFF rode its Land Reform electioneering into 25 seats in parliament (out of 400). Recently, we have seen even some of those die-hard EFF parliamentarians scorched by scandal. One senior leader had proposed the establishment of a State Bank, only to be accused of impropriety in the VBS scandal (his provincial bank). This is reverberating into the EFF, which would have been better to champion credit unions, community banking, stokvels, etc. Setting up a State Bank in the light of the looting of VBS, state-owned enterprises, government departments and even Treasury, seems disingenuous. The EFF has also been challenged by AfriForum on the hard right, for its racist rhetoric. For across the economic spectrum, non-racialism is a non-negotiable in South Africa. Especially to those who sacrificed a sheep on the beach recently to “cleanse” it. To the horror of animal-rights activists, also on the Left. It just goes to show how complicated this three-legged race can get. 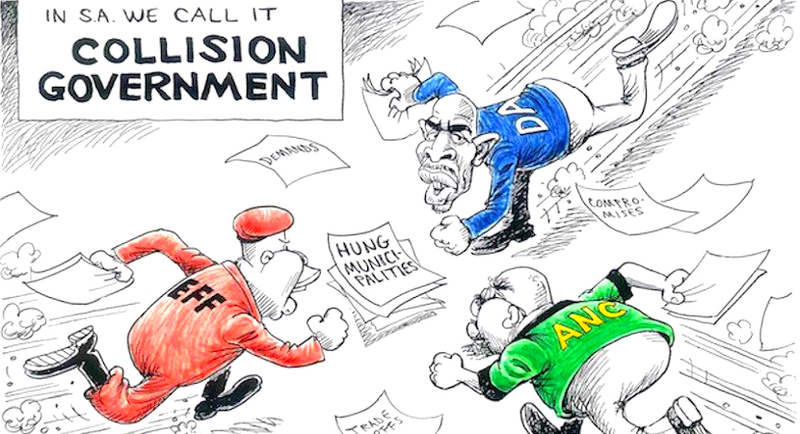 The Left of the ANC has to stay out of step with the hard Left, and its Right has to stay out of step with the official Opposition on that side. Tying two legs together is the ANC’s “unity” strategy, but it ends up incoherent. The right hand literally does not know what the left hand has been doing. At the 2009 general election, the main issue was Triumphalism versus Constitutionalism. In short, whether Jacob Zuma was a suitable candidate for president or not. The ANC got that wrong, terribly wrong. At the 2014 general election, the EFF got it right, very right – about Land Reform. They got this issue onto the front burner. But in 2019, the two major issues are Jobs and Corruption. Put another way – inequality, unemployment and the rule of law. This time, though, it is a three-legged race, not the two-horse race that we have known in the past. Chuck Stephens from Desmond Tutu Centre for Leadership writing in his own capacity.